-Attached to a couple of 300GB iSCSI LUNs hosted on EMC Storage. -Created the initial External virtual network on each Hyper-V host using Hyper-V Manager. In this step, we will use the Failover Cluster Manager MMC to create the cluster quorum. The cluster quorum stores the cluster configuration data (such as cluster services, applications, resources, and networks) and maintains the current state of each cluster node. A cluster node uses the quorum data to determine what it should do, ie, does the node need to activate/deactivate any cluster local services or applications. Windows Server 2008 supports four cluster quorum models, each listed below with a brief explanation. Suited for failover clusters with an odd number of nodes. When determining the state of the cluster, only the available nodes are counted. When using the Node Majority Quorum, the cluster will continue to run if the number of available hosts is greater than the number of failed hosts. In a 3 node cluster, 2 cluster nodes must be active for the cluster resources to be available. In a 5 node cluster, 3 cluster nodes must be available, etc, etc. This is similar to the Node and Disk Majority, but instead of being installed on its own disk, the quorum is stored on a file share. This quorum type is suited for clusters with an even number of nodes and no shared storage. Cluster resources are available as long as one cluster node and the disk quorum are available. However, the cluster will fail should the disk quorum be unavailable, making the quorum a single point of failure. For this failover cluster, I chose to use a Node and File Share Majority Quorum. No specific reason, but likely because of the Exchange 2007 CCR clusters I’ve been installing lately. 2. 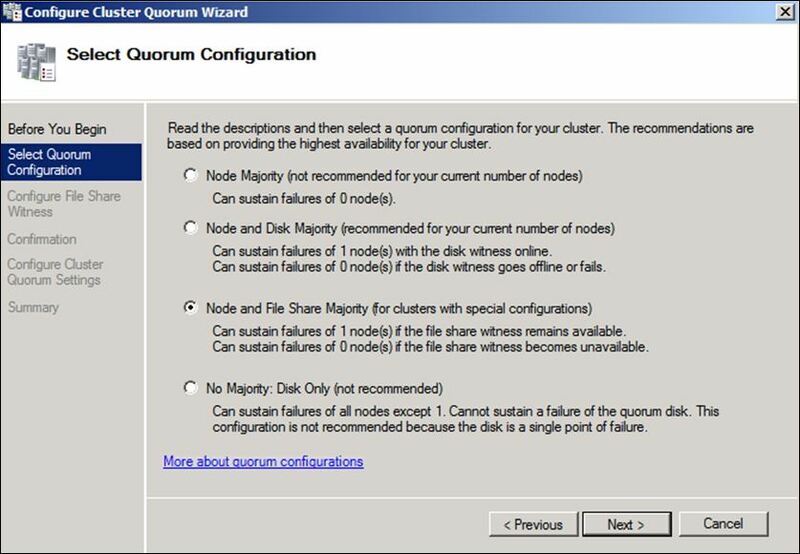 On the Select Quorum Configurations page, select the quorum option best suited for your failover cluster and click Next. In this example, the Node and File Share Majority option was selected. 3. 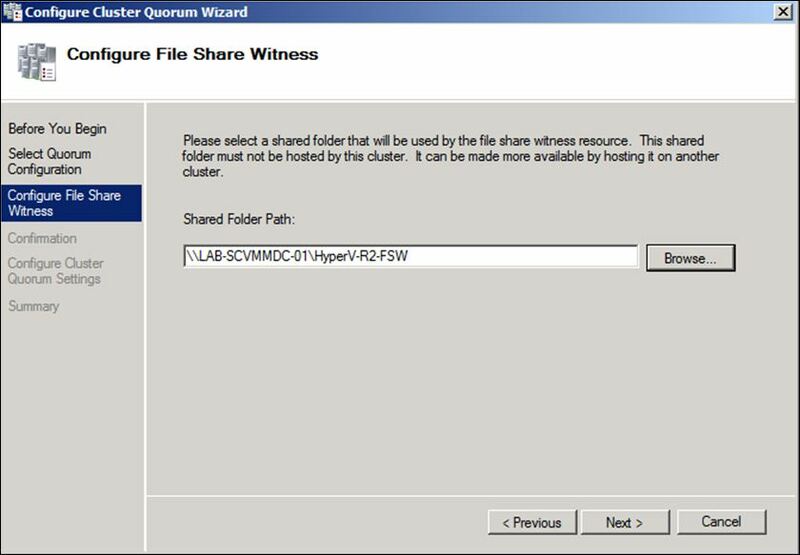 On the Configure the File Share Witness page, enter the network path to the file share to hold the quorum and click Next. 4. On the Configurationscreen, verify the shared folder path is correct and click Next. 5. Click Finish on the Summary screen to complete the Configure Cluster Quorum Wizard.